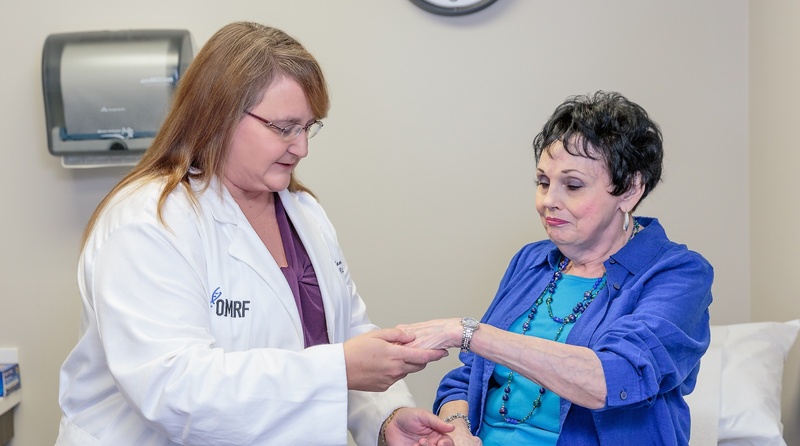 OMRF scientists need volunteers for the first-ever lupus prevention study. Family members of lupus patients are especially encouraged to participate. The clinical trial, known as the SMILE trial, seeks to identify individuals at high risk for developing lupus and treat them with an immune-modifying medication before they ever transition into the disease. The goal is to delay the onset of lupus, lessen its symptoms and potentially prevent it altogether. Lupus is caused when the immune system becomes unbalanced, leading to the development of autoantibodies and chronic inflammation that damage the body’s organs and tissues. According to the Lupus Foundation of America, an estimated 1.5 million people in the U.S. are living with lupus. The disease also disproportionately affects healthy relatives of lupus patients. For this reason, a team of researchers looked at relatives of patients over an eight-year period to see if they could discover a way to identify those at high risk before the disease ever begins. By studying relatives of lupus patients, James discovered that 89 percent of family members stayed healthy, while 11 percent developed the disease. Of those who transitioned to lupus, all displayed autoantibodies—inflammatory proteins that the body mistakenly unleashes against its own cells and tissues. For the trial, James and her team test participants for these specific autoantibodies in the blood and place them on a test medication. The trial is actively recruiting new participants who are at risk for developing lupus. In order to qualify, an individual must have a positive ANA test and at least one other lupus symptom. Symptoms of lupus include skin rashes, joint pain, joint swelling, anemia, extreme fatigue, mouth sores or sunlight sensitivity. To participate in the trial or receive more information, please call (405) 271-7221. Participants will be compensated $50 per visit for their time and effort.